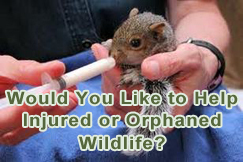 The mission of Help 4 Wildlife is to provide care, treatment and release for orphaned and/or injured wildlife and to advocate for their welfare while promoting humane values and providing education to the public. Education is the key to wildlife rehabilitation both for the rehabbers themselves and for the public, as well. 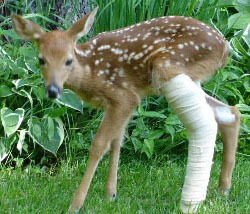 We have dedicated and licensed rehabbers through the state of Michigan with up to date certificates and knowledge of the latest rehabilitation techniques as well as medications and formula for feeding our animals. We are looking for serious volunteers who would like to work under us to eventually become licensed wildlife rehabilitators through the State of Michigan. If you are interested in rehabilitation of squirrels, woodchucks, opossums, raccoons, or rabbits, please use our contact form and we will call you back to discuss your wishes.